The Rey del Mundo Choix Du Roi 2016 RE Belux 2016 is a creamy Habano, of 55 ring gauge, 5.1” (130mm) long and only available in limited quantity. Its flawless construction and its beautiful flavor profile gives it a great potential for aging. The Rey del Mundo Choix Du Roi 2016 RE Belux 2016 comes in a numbered semi boite nature box of 10 cigars (only 9,000 have been produced) with Habanos packing code SBN-UW-n-10-n-10 . The wrapper has a beautiful creamy chocolate color, a virtually veinless Colorado Claro. The cigar feels smooth with no imperfection and a neat triple cap. No soft spots, it well packed from the cap to the foot. The Choix du Roi sports a secondary band that reads “Regional Edition” in addition to the regular Rey del Mundo band. 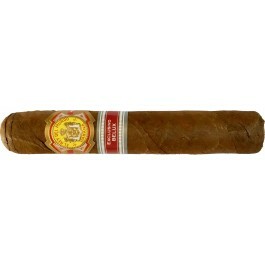 The aroma at cold is mainly of the typical Cuban woodiness. The Choix du Roi lights up effortlessly and reveals a draw that is spot on, with the right amount of resistance. Lots of smoke from the get-go. Ample wood right away, with plenty of creamy flavors as well. Pretty unexpected from a young cigar. Very typical Cuban flavors that are not overpowerful. The cigar is at a mild-to-medium level. The great construction on the Choix du Roi allows it to burn slowly and can stay lit for some time without needing attention. The intensity of flavors ramp up in the middle third, where the creaminess recedes almost completely and there is now just wood and earth. There are also some faint fruity notes and some nuttiness on the retrohale. The body is at a medium level now. Letting the cigar away for a couple of minutes allows it to reveal more complexity towards the end of the cigar. The creaminess is back with now some sweeter notes, such as vanilla. When getting closer to the nub, some hints of ammonia come in the forefront revealing the young character of the Choix du Roi but without compromising a great smoking experience. Overall an unmissable Regional Edition which will only get better with age, but hurry up, only limited quantity available!